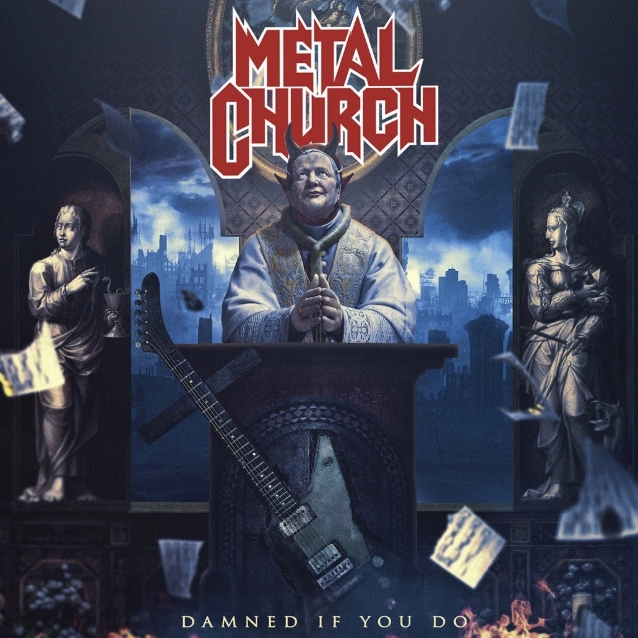 The official music video for “Damned If You Do”, the title track of the 12th full-length studio album from West Coast metal veterans METAL CHURCH, can be seen below. The song is quintessential METAL CHURCH and showcases the sound that has garnered the band fans all around the globe, with its driving guitar riffs, punishing drum beat and instantly recognizable vocals. “Damned If You Do” will be released on December 7 via Rat Pak Records. The effort will also be available in Europe via Nuclear Blast and Japan via King Records. The latest release is the follow-up to 2016’s “XI”, which saw the return of Howe. “Damned If You Do” is described in a press release as “a cross between the band’s iconic ‘Blessing In Disguise’ and ‘The Human Factor’. This new offering features ten fully charged, classic-metal-influenced songs that showcase the sound that has garnered the band a solid fanbase for over three decades,” the press release adds. “Damned If You Do” also features Stet Howland (ex-W.A.S.P., LITA FORD), who joined METAL CHURCH as the replacement for longtime drummer Jeff Plate. Soon after hooking up with the group, Stet was diagnosed with diffuse large B-cell lymphoma. Miraculously, his treatments for the aggressive non-Hodgkin lymphoma worked and he was able to begin recording the new album. “Damned If You Do” is something truly unique and special. The songs are powerful, precise, and METAL CHURCH‘s musical vision is unified. From the haunting opener “Damned If You Do” to the final hard-edged track “The War Electric”, this new album is sure to resonate with fans from the band’s early years while garnering new ones. Songs like “By The Numbers”, “Guillotine” and “The Black Things” are sure to become instant favorites! “Damned If You Do” is available in various formats and bundle configurations, including a limited blue, black and white vinyl pressing with an alternate track sequence also an Ultimate Fan Bundle that includes a personal “thank you” phone call from Howe.